If you have no or limited paddling experience and are interested in learning kayaking via our pool sessions, you may contact us to check availability. You need to be aged over 18 years, be able to swim and be reasonably fit. Once you are proficient in basic kayaking skills, capsize drill and rescues you will be able to progress on to flat water trips, Thames sessions, beginner polo, beginner white water or surf trips. The paddler progression page shows details of all the club activities and their suitability to your level of ability. As you progress you will be able to participate in more of the club's activities. 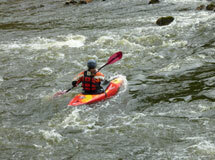 We have a lot of talented and experienced paddlers who are willing to help, coach and discuss. All members are encouraged to make full use of this experience and knowledge as it is the club’s greatest resource. See the coaching page for more details. If this sounds like the club for you, contact us and we’ll give you some advice on how to start out and get involved! 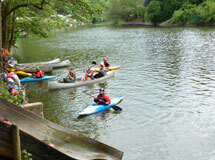 If you are an experienced paddler wanting to join the club, please contact us for more information. We are not set-up to accommodate individuals or groups wishing to just train for the purposes of entering a particular event (e.g Devizes to Westminster, quadrathlon's, adventure races, etc). There are several other clubs in the London area which may be better suited for this purpose.